We all love a good night's sleep. But I think adequate rest is a more important factor for decision making in the hills than many people give it credit. The human body has been conditioned to sleep at night and be active during the day. Therefore it's more natural to be at the top of the mountain in the afternoon/ evening than first thing in the morning. And it goes without saying, but it's more aesthetic to ski lines in the sunshine than in the shade (there are always exceptions to that basic idea though :). A well rested skier is a skier that's stronger physically and sharper mentally. We often hear and read stories of sleep deprived alpinists, on the move for 24 hrs or more. What you don't often hear about are stories of poor decisions that folks have made, directly as a result of mental fatigue. I personally have been avalanched because I made a poor decision, in large part due to lack of sleep. Now I am more aware of the cobweb influence there. Where route finding decisions and safety lie in a delicate balance, the importance of sleep/ rest should not be taken lightly. Second reason: westerly aspects often have a more manageable avalanche hazard (take this with a grain of salt). Here in North America, and where I've traveled in Europe, Asia and New Zealand, westerly aspects are typically the windward aspects, and thus they are often less loaded by new snow and/or wind events. That can often translate into a more manageable avalanche hazard, and safer skiing. Disclaimer, this is far from a rule, but just a general piece of information to digest when planning ski objectives. Third reason: Alpenglow! 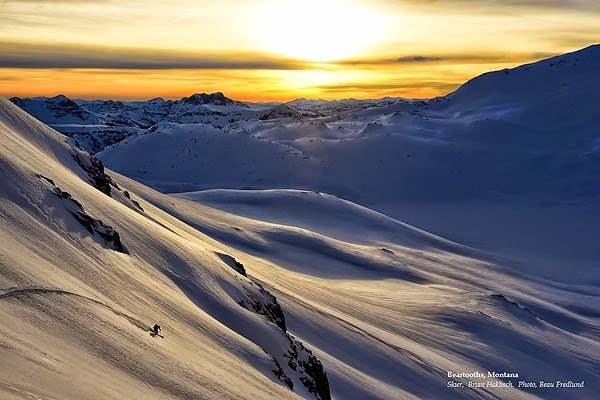 Mmmmm, nothing quite like watching a stunning sunset from high on a peak, then skiing down amongst orange snow. Yes, there's always been a hype around the 'dawn patrol', and I definitely agree that sunrises from the alpine are magical, but so are sunsets! Especially, if a storm system moves out slowly during the day. I wouldn't necessarily make being benighted a common plan. But if the reproach isn't glaciated, and you have a trusty Mammut headlamp in your pack, it might just be something to work into your tour plan from time to time.